Starring: Lauren Cohan, Rupert Evans, and more. Another week of movie releases, another attempt at horror comes to us in the form of a porcelain doll. January 22nd, 2016, the release date of ‘The Boy’. The new horror movie is taking on crowds and presenting its style with director William Brent Bell at the helm. Horror enthusiasts: is this the movie for you? 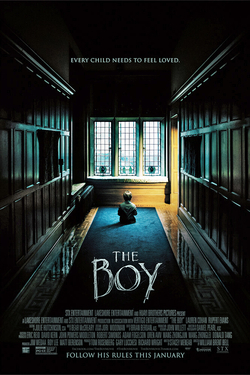 ‘The Boy’ starts off with an American native, Greta Evans (Lauren Cohan) who is hired as a nanny for a family in England. Looking to start off fresh and new from her seemingly troubled past, she now meets the family she will be a nanny to. A family of three; a father, a mother, and their son. Yet, the reveal of whom this son is exactly takes Greta by surprise as she finds out that their “son” is actually a porcelain doll. The mother and father, Mr. and Mrs. Heelshire (Jim Norton and Diana Hardcastle), treat him as a living being nonetheless. Greta first expects the scenario to be some sort of joke but the family explains it is anything but that. When Mr. and Mrs. Heelshire go on their planned vacation, the fact that the doll of their son, Brahms, seems to actually be some kind of living being, becomes extremely evident as the story of the film begins to really cook up and the unexplained occurrences only start to scare Greta more and more and takes the audience on a ride to remember. So, as many of my closest acquaintances know, the horror genre is a very sensitive subject to me when it comes to what I like and what I do not like. As most horror films have come within years, I have not been a fan of very many especially one of my recent views, ‘The Forest’. ‘The Boy’ however, get ready for it… impressed and shocked me. I am a huge fan of ‘The Boy’. I found the scare moments not that bad, I even fell for one jump scare but even beyond the scare moments, I felt creeped out at some of the moments presented by this film. Even after a certain point, I found myself unable to close my mouth because the film made my jaw drop in shock as some of the very eerie moments started to unravel and I lost myself in what was happening. By the end of the film I was overall shocked and appreciative of the story and how everything played out. So yes people, I am a fan of this horror flick. I would advise people to go out and check this one out, it is great for date night, it is great in regards to story and eerie horror elements, overall, it was a pretty damn great film.